Hi! We are Nevin and Natalie! We are a bonded pair (maybe daddy and daughter?) and are the most special pair of dogs imaginable. Really. Our foster mom says we are the 2 nicest Great Pyrenees dogs that she has ever had the pleasure to know, which is a stunning statement, because she has rescued and fostered easily 75 of them, and pretty much every one has been a total gem! Wowza! That kind of praise makes us a little embarrassed, but it’s mighty nice to be seen to be so extra special! 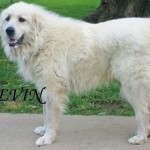 Nevin is about 4 years old and about 85 pounds. 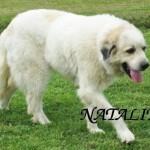 Natalie is about 2 years old and about 90 pounds. Good with dogs: Yes, both of them like dogs! Good with cats: Not yet tested, but highly likely. Great Pyrs are almost always very gentle with cats. Good with kids: Not yet tested, but highly likely to be good with gentle, respectful kids. Ok, so sad story. Despite being the sweetest dogs ever, someone dumped us on an isolated rural road in a southern state. We were picked up by the local shelter folks and taken to a pretty dismal high kill shelter. We were found to have the most wonderful personalities, but were heartworm positive, so were going to be euthanized. Lucky for us, a wonderful rescue lady heard about us and got us out of the shelter and into a boarding kennel, and to a veterinarian! We stayed there for a month and then moved to the rescue lady’s house and finished our heartworm treatment! We are doing great, and the best part is that the rescue lady says that a) she will find us a home where we can stay together forever and b) we can stay with her at her house in KY until she finds us that awesome forever home! Yay!! We are both extremely laid back, very affectionate, absolutely gorgeous (we have grey and tan on our ears and a tan spot in the middle of our backs!) and have the softest fur and the most loving eyes. We love attention, petting, love, being talked to, and just spending time with and near you. We pretty much constantly exude love and sweetness….we’re told that being around us fills up everyone’s hearts in the best way possible. Our foster mom thinks we would make fabulous therapy dogs, if anyone was looking for dogs like that! Both of us are big lovebugs, but I’m (Nevin) the biggest of all! I like it so much when my foster mom sits on the huge dog bed on the floor in our room…I get so happy, pad over to her, lay gently right on top of her legs, and put my head in her lap! Natalie is also a love seeker, and comes over and gently thwaps our foster mom with her big furry paw, pleading for her share of the attention and love! I do the Pyr thwap too, if she stops petting me! Always gentle, always adorable! We love to be touched, petted and massaged in any way, we are so happy for the attention and care. We are on the calm side for sure, but do play occasionally when the urge strikes us! 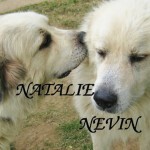 Natalie plays a bit more than I (Nevin) do….we play together occasionally and Natalie also plays with Joshua, another Pyr. (She thinks he is very handsome!) [FYI for followers of CDR dogs, Joshua is the same Joshua who was lost in Freeville all summer and was eventually found/recaptured and returned to his KY original rescuer, this same rescue lady!). Natalie and I really love each other, and have never had a cross word between us. Natalie is a bit impish, while I am a bit more humble and grateful for every little thing. Natalie’s got me wrapped around her little paw for sure…if the rescue lady didn’t hold her back away from my bowl, I would let her eat all of my food whenever she wanted to! I’m a big soft pushover for my girl! We are very accepting of all of the other dogs at the rescue lady’s house — even the most hyper ones. The rescue lady thinks we would be fine in a home with other dogs but would absolutely love the undivided attention we’d get if it was just the two of us. Like most Pyrs, we aren’t very interested in toys and games, we are much more interested in just being with our people in loving, sweet ways. We LOVE going for walks, and are getting to be quite nice on leash. Natalie was a bit of a puller earlier, but she has gotten the hang of leash manners now! We are both recovered from heartworm treatment and doing great!! No other health issues, we are healthy, gorgeous dogs! We are in foster care in KY, but it’s really not a problem for us to be transported up north for the right forever family. If you are interested in learning more about us, please fill out an online adoption application and the rescue will forward it to our current foster mom who will be in touch! Prior experience with Great Pyrenees will be considered a plus. If you do not have any experience, please research the breed before applying so that you are familiar with their traits and tendencies and know whether a pyr would be a good fit for you and your family. good with cats, good with dogs, good with kids, Great Pyrenees, large. Bookmark.